l-r: Benjamin Bai (Ant), Michelle Holoubek (Stern, Kessler, Goldstein & Fox), Andrea Perronace (Jacobacci Partners), Clare Dillon (Clare Dillon Consultants), Grant Philpott (EPO). EPO officials consider their current practice for patenting “computer implemented inventions” (CII) a good start to allow for AI patents, and pointed to an update to their CII guidelines to be published in October 2018. Grant Philpott, EPO’s chief operating officer for patenting in the ICT area, summarised the discussions by saying, “It seems the current European-based system of software patenting provides opportunities on which we can build without the need for legislative change.” An update in the CII guidelines would give practical recommendations to the applicants and to the patent examiners on how to allow artificial intelligence technology and machine learning-related inventions to take the two hurdles set out by the CII guidelines, he said. “Are we not just talking about mathematics?” is the question to be answered, said EPO’s Koen Lieven when presenting the current practice to deal with software patent applications. So far algorithms like mathematical models “per se” are considered as non-patentable. In the second step, which checks on novelty and inventive step of the application, EPO examiners are held to not discard any of the technical features of “these mixed type applications,” Lieven assured participants. AI algorithms as far as they are part of a technical implementation fit the system very well, as long as they are not too general. For big applicants like Ant Financial Services, which is an affiliate company of Alibaba, the current practice still is insufficient. Were he to have to limit algorithm patent applications to one specific application, his company might have to file several thousand applications for the same algorithms put to work in different implementations. “That would clog the system,” Bai joked. For this very reason, he is lobbying for a change of patent legislation in China to allow the patenting of AI algorithms. “Algorithms are not that different from mechanics,” Michelle Holoubek, director at the US patent lawyers Sterne Kessler & Fox, said in seconding Bai. New pharmaceutical compounds could be patented as well as individual genes, Holoubek and Bai argued. “We need a change of mindset,” said Holoubek. A majority of participants at the EPO event seemed to be fine with the CII patenting practice, which nvertheless remains controversial given that patenting software according to the legal text of the European Patent Convention remains a no go. Organisations like the Free Software Foundation Europe which were not at the stage in Munich continue to warn against the negative effects of patent thickets for software programming and innovation. l-r: Heinz Goddar (Boehmert&Boehmert), Keith Bergelt (Open Innovation Network), Herbert Zech (University of Basel), Rob Sterne (Sterne, Kessler,Goldstein & Fox). 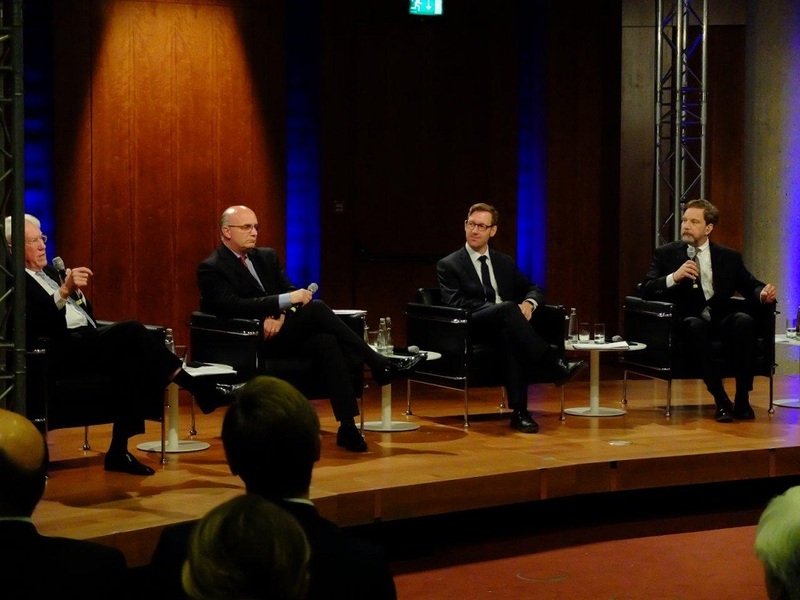 Several panellists nevertheless cautioned against going down the road to deeper levels of protection. Keith Bergelt, speaking for the Open Invention Network, reminded conference participants that “many don‘t believe that IP should apply to any of these technologies.” With collaborative development, especially for the non-IT generic industry sectors from automotive to medical being on the rise, a turning back to more rigid patent and patent enforcement regimes seems contradictory to the trend. The automotive industry, for example, is moving to open source for survival, Bergelt hinted. Despite his promotion of open source, Bergelt nevertheless said that to some extent copyright is insufficient, and patents are needed for protection for software that enabled hardware. But granting patents to core technology – or general algorithms – in Bergelt‘s opinion nevertheless is wrong. “We do not want to put the control point too far down in the stack,” he warned. 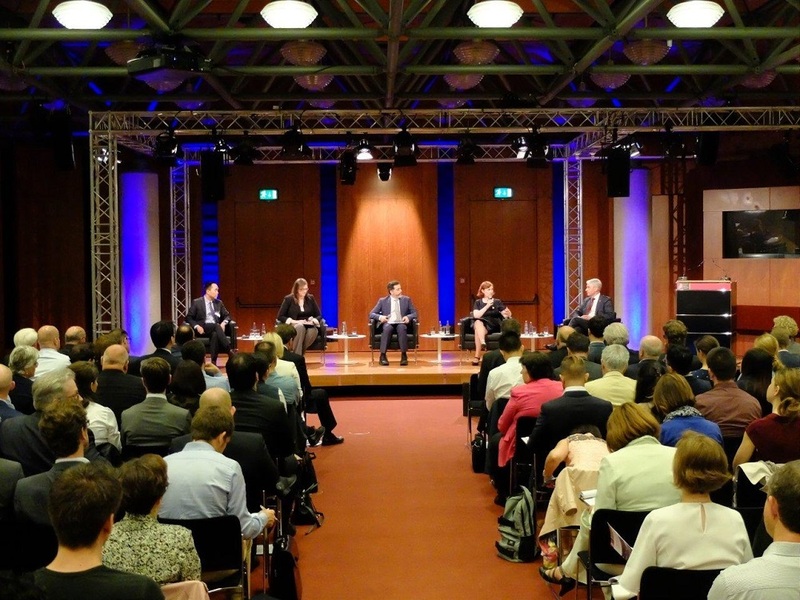 Clara Neppel, senior director of the IEEE European Office in Vienna, said given that AI is a technology just beginning to evolve, “the patents people could get could be very foundational and of course the patent offices have a special responsibility because that will grant monopolies for 20 years.” Patenting core AI technology could have far-reaching effects on competition, innovation and political strategies. The computer scientist underlined that there is a need for a much broader discussion of such questions. “We have not seen many AI patents yet and those have not been litigated yet,” reported Matthias Schneider, chief licensing officer at Audi AG, who made the disclaimer that he could on this issue not talk for his company. Schneider said what he is most concerned about in practice is what to do with inventions made by AI in his company. Disclosure, enforcement and even remuneration for the inventor became somehow rather difficult. “Should we give the computer a gold power chord?” he joked. Perhaps, Schneider considered, it does not make sense to protect the neuro-metallurgical network with a patent, but instead make it a trade secret and protect the resulting outcome with a design right. At some point in time, Schneider warned, “we will not be able to understand how that inventions have been made.” If Audi‘s AI systems comes up with a neuro metal, “we end up with four gigabytes of binary code in the car, but what is the value of that code?” Schneider asked. It would be rather difficult to prove that somebody using the same code had infringed a patent. Schneider‘s main concern is that granting patents to owners of AI systems that themselves create new inventions could create huge monopolies and extend the lifetime of patents in perpetuity. “First you patent the program that creates inventions and then you patent the inventions that they do?” he asked. The idea that the owner of AI systems should own patents was also called into question by Peter Blok, professor at the Center for Intellectual Property Law of Utrecht University. Blok said that instead of the AI owner, the user – developers or operators – should be granted rights. A system owner would only be incentivized to own a system. A developer instead might by using the system to come up with something new. Some considerations for the users also came from Heinz Goddar, patent attorney at Boehmert and Boehmert. Goddar pointed to the fact that AI systems basically were perfected through training using huge data sets. This would lead to the question, “What do we do with the people whose data have been used in such an invention?” The recommendation of the German patent attorney was that provisions similar to the ones in the biodiversity had to be found to compensate those whose data was used. EPO officials said they would continue the related discussions and showed more appetite for checking on the role of patents for buzzword technologies. 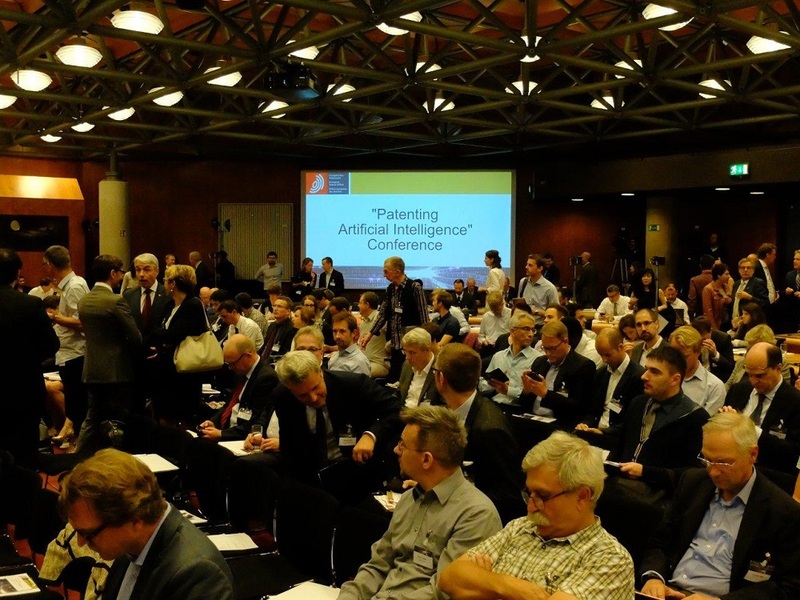 Around November, the EPO will organise a conference on patenting and the blockchain technologies. Participants at the EPO AI event. "European Patent Office Discusses Patenting Artificial Intelligence" by Intellectual Property Watch is licensed under a Creative Commons Attribution-NonCommercial-ShareAlike 4.0 International License.